Install Python 2.7.X or 3.4+. Follow the platform-specific instructions (dependencies). (Optional): Install additional software for special features. Run Scapy with root privileges. Each of these steps can be done in a different way depending on your platform and on the version of Scapy you want to use. Follow the platform-specific instructions for more detail. In Scapy v2 use from scapy.all import * instead of from scapy import *. The following steps describe how to install (or update) Scapy itself. Dependent on your platform, some additional libraries might have to be installed to make it actually work. So please also have a look at the platform specific chapters on how to install those requirements. The following steps apply to Unix-like operating systems (Linux, BSD, Mac OS X). For Windows, see the special chapter below. Make sure you have Python installed before you go on. To get the latest versions, with bugfixes and new features, but maybe not as stable, see the development version. Install the Git version control system. You can run scapy without installing it using the run_scapy (unix) or run_scapy.bat (Windows) script or running it directly from the executable zip file (see the previous section). For some special features, Scapy will need some dependencies to be installed. Most of those software are installable via pip. Here are the topics involved and some examples that you can use to try if your installation was successful. 2D graphics. psdump() and pdfdump() need PyX which in turn needs a LaTeX distribution: texlive (Unix) or MikTex (Windows). Graphs. conversations() needs Graphviz and ImageMagick. Graphviz and ImageMagick need to be installed separately, using your platform-specific package manager. 3D graphics. trace3D() needs VPython-Jupyter. PKI operations and TLS decryption. cryptography is also needed. Fingerprinting. nmap_fp() needs Nmap. You need an old version (before v4.23) that still supports first generation fingerprinting. Finished to send 8 packets. Scapy can run natively on Linux, without libdnet and libpcap. Install Python 2.7 or 3.4+. Then install Scapy via pip or apt (bundled under python-scapy) All dependencies may be installed either via the platform-specific installer, or via PyPI. See Optional Dependencies for more information. On Mac OS X, Scapy does not work natively. You need to install Python bindings to use libdnet and libpcap. You can choose to install using either Homebrew or MacPorts. They both work fine, yet Homebrew is used to run unit tests with Travis CI. Then install Scapy via pip or pkg_add (bundled under python-scapy) All dependencies may be installed either via the platform-specific installer, or via PyPI. See Optional Dependencies for more information. Scapy is primarily being developed for Unix-like systems and works best on those platforms. But the latest version of Scapy supports Windows out-of-the-box. So you can use nearly all of Scapy’s features on your Windows machine as well. Python: Python 2.7.X or 3.4+. After installation, add the Python installation directory and its Scripts subdirectory to your PATH. Depending on your Python version, the defaults would be C:\Python27 and C:\Python27\Scripts respectively. Npcap: the latest version. Default values are recommended. Scapy will also work with Winpcap. Scapy: latest development version from the Git repository. Unzip the archive, open a command prompt in that directory and run python setup.py install. Just download the files and run the setup program. Choosing the default installation options should be safe. (In the case of Npcap, Scapy will work with 802.11 option enabled. You might want to make sure that this is ticked when installing). After all packages are installed, open a command prompt (cmd.exe) and run Scapy by typing scapy. If you have set the PATH correctly, this will find a little batch file in your C:\Python27\Scripts directory and instruct the Python interpreter to load Scapy. If really nothing seems to work, consider skipping the Windows version and using Scapy from a Linux Live CD – either in a virtual machine on your Windows host or by booting from CDROM: An older version of Scapy is already included in grml and BackTrack for example. While using the Live CD you can easily upgrade to the latest Scapy version by using the above installation methods. You may not be able to capture WLAN traffic on Windows. Reasons are explained on the Wireshark wiki and in the WinPcap FAQ. Try switching off promiscuous mode with conf.sniff_promisc=False. 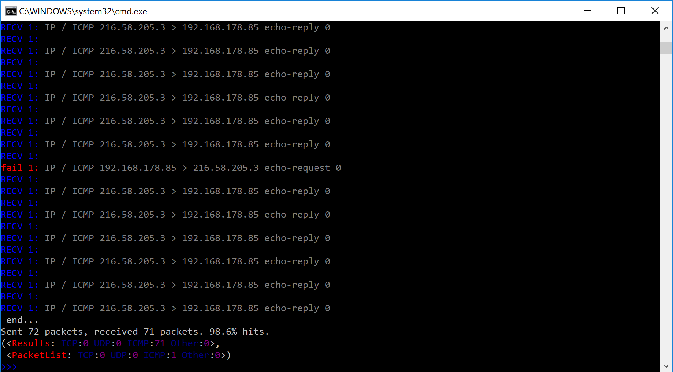 Packets sometimes cannot be sent to localhost (or local IP addresses on your own host). As Winpcap is becoming old, it’s recommended to use Npcap instead. Npcap is part of the Nmap project. This does NOT apply for Windows XP, which isn’t supported by Npcap. If you get the message 'Winpcap is installed over Npcap.' it means that you have installed both Winpcap and Npcap versions, which isn’t recommended. To use Npcap instead, as those files are not removed by the Winpcap un-installer. In some cases, it could also mean that you had installed Npcap and Winpcap, and that Windump is using Winpcap. Fully delete Winpcap using the above method to solve the problem. The Scapy project’s documentation is written using reStructuredText (files *.rst) and can be built using the Sphinx python library. The official online version is available on readthedocs. You can now open the resulting HTML file _build/html/index.html in your favorite web browser. This will generate a classes_fields.png picture containing the inheritance hierarchy. Note that you can provide as many modules or packages as you want, but the result will quickly get unreadable. In this case, Pyreverse will also generate a packages_dhcp_ans.png showing the link between the different python modules provided. © Copyright 2008, 2019 Philippe Biondi and the Scapy community Revision 033fe786.